This was going to be a bracelet. That was before I goofed up the placement of the end caps. Instead of tearing it apart, I changed it into a necklace. I added another piece of leather cording onto the other side, and viola, it’s a necklace. I did add the dangle after as it seemed kind of plain. I kind of like the mish mash of different beads. 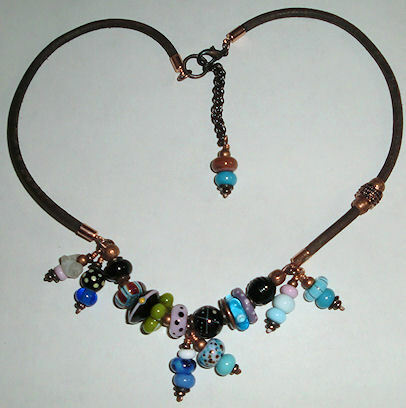 I might make another necklace all out of different beads. Great way to use up extras.